I do not know any multimodal distributions. 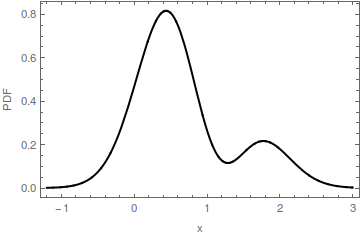 Why are all known distributions unimodal? Is there any "famous" distribution that have more than one mode? Of course, mixtures of distributions are often multimodal, but I would like to know whether there exist any "non-mixture" distributions that have more than one mode. The first part of the question is answered in comments to the question: plenty of "brand-name" distributions are multimodal, such as any Beta$(a,b)$ distribution with $a\lt 1$ and $b\lt 1$. Let's turn, then, to the second part of the question. All discrete distributions are clearly mixtures (of atoms, which are unimodal). I will show that most continuous distributions are also mixtures of unimodal distributions. The intuition behind this is simple: we can "sand off" bumps from a bumpy graph of a PDF, one by one, until the graph is horizontal. The bumps become the mixture components, each of which is obviously unimodal. 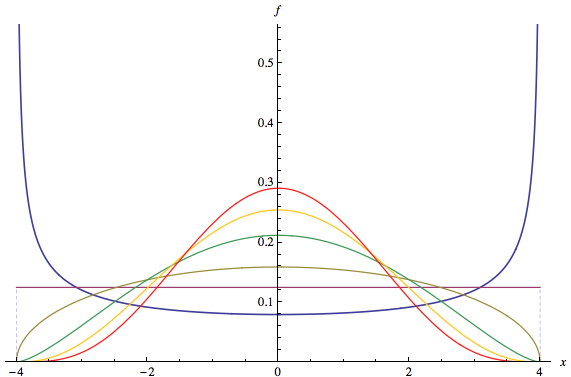 Consequently, except perhaps for some unusual distributions whose PDFs are highly discontinuous, the answer to the question is "none": all multimodal distributions that are absolutely continuous, discrete, or a combination of those two are mixtures of unimodal distributions. $f$ has a constant value on $m,$ say $y$. $f$ is not constant on any interval that strictly contains $m$. There exists a positive number $\epsilon$ such that the maximum value of $f$ attained on $[x_l-\epsilon, x_u+\epsilon]$ equals $y$. Let $m = [x_l, x_u]$ be any mode of $f$. Because $f$ is continuous, there are intervals $[x_l^\prime, x_u^\prime]$ containing $m$ for which $f$ is nondecreasing in $[x_l^\prime, x_l]$ (which is a proper interval, not just a point) and nonincreasing in $[x_u, x_u^\prime]$ (which is also a proper interval). Let $x_l^\prime$ be the infinimum of all such values and $x_u^\prime$ the supremum of all such values. This construction has defined one "hump" on the graph of $f$ extending from $x_l^\prime$ to $x_u^\prime$. Let $y$ be the larger of $f(x_l^\prime)$ and $f(x_u^\prime)$. By construction, the set of points $x$ in $[x_l^\prime, x_u^\prime]$ for which $f(x)\ge y$ is a proper interval $m^\prime$ strictly containing $m$ (because it contains either the whole of $[x_l^\prime, x_l]$ or $[x_u, x_u^\prime]$). 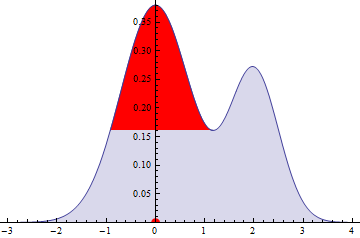 In this illustration of a multimodal PDF, a mode $m=[0,0]$ is identified by a red dot on the horizontal axis. 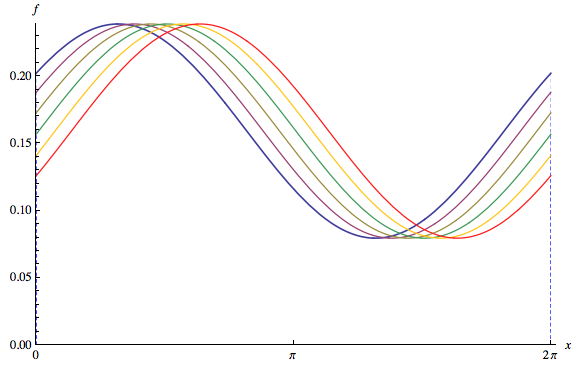 The horizontal extent of the red portion of the fill is the interval $m^\prime$: it is the base of the hump determined by the mode $m$. The base of that hump is at height $y\approx 0.16$. The original PDF is the sum of the red fill and the blue fill. Notice that the blue fill only has one mode near $2$; the original mode at $[0,0]$ has been removed. when $x \in m^\prime$ and $f_m(x)=0$ otherwise. (This makes $f_m$ a continuous function, incidentally.) The numerator is the amount by which $f$ rises above $y$ and the denominator $p_m$ is the area between the graph of $f$ and $y$. 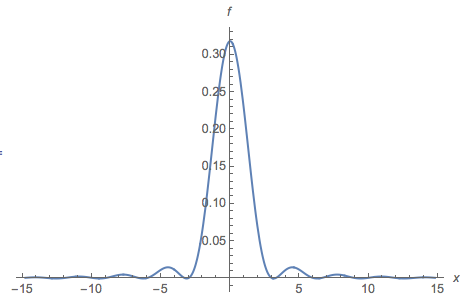 Thus $f_m$ is non-negative and has total area $1$: it is the PDF of a probability distribution. By construction it has a unique mode $m$. is a mixture of the unimodal PDF $f_m$ and the PDF $f_m^\prime$. ... plus or minus some skewness or some discontinuities? When the question is posed thus, the Beta distribution would not be a valid counter example. It appears the OP's conjecture has some validity: most common brand name distributions do not allow for more than one interior mode. There may be theoretical reasons for this. For example, any distribution that is a member of the Pearson family (which includes the Beta) will necessarily be (interior) unimodal, as a consequence of the parent differential eqn that defines the entire family. And the Pearson family nests most of the best-known brand names. That you mightn't think of any doesn't mean there aren't any. I can name "known" distributions that aren't unimodal. For example, a Beta distribution with $\alpha$ and $\beta$ both $<1$. Mixture distributions are certainly known, and many of those are multimodal. where $\varphi$ is the PDF of a standard Gaussian. Not the answer you're looking for? Browse other questions tagged distributions mode or ask your own question. 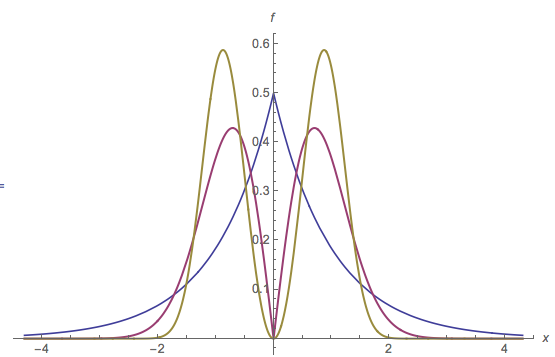 Bimodal univariate distributions are always indicative of a mixture of two random variables. Is this correct? Is it valid to use Hartigans' dip test to reject uni-modal null hypothesis with large N? Unimodal or bimodal data (MATLAB)? What is the difference between a mixture model and a multimodal distribution? How to compare multimodal distributions?